Feliks Audio is a Polish company that produces all of their amplifiers from the ground up and “in house” as they’ve so eloquently put it. I’d previously never heard of them, but requests to review one of their products became so intense at one point, that I had to reach out to the company for a sample. I spoke to a nice gentleman named Lukasz who worked there and my Espressivo arrived just a few short days later. Unlike most companies, they’ve kept up with me as the review progressed and were eager to listen to my thoughts on the product. That sentiment is one I wish more companies would adopt…excitement and fever for feedback is something I understand and enjoy talking about. When I get to talk to the engineers and company heads who don’t wish to remain in the shadows, I feel closer to the company and in turn the experience ends up being more intimate for me. I know these guys worked hard and their efforts really show, so being able to talk to them about it along the way was very cool. Coming in three different wood panel color varieties, the Espressivo is a solid metal chassis OTL headphone amp/preamp that has been hyped so massively over at Head-Fi’s forums, that I am baffled as to how I have yet to come across one at an audio meet. I’m not even sure there is a single negative statement on the Internet revolving around this amp and how well it performs…believe me, I tried looking and just couldn’t find a realistic or logical gripe even worth mention in a negative light. Both the volume knob and Line selection knob feel of a very high quality, the latter of which offers a very satisfying clink for each position between 1 and 3. No need to go into the aesthetics of the amp beyond that is it very good looking, very classy and oozing a price tag far above what the actual cost is. Sure, the amp is single ended 1/4 output only, but at this price, I cannot honestly complain and after considering how good the product actually sounds. The Espressivo is a fully RCA input design with three Inputs on the rear, as well as a line in. At this price point, it is more than justified and I am hard pressed to find another amp that sounds this good that also included three inputs with a corresponding input selector knob on the front of the device. This amp also has a pair of power tubes, as well as driver tubes from the 6N1P/6N6P family. 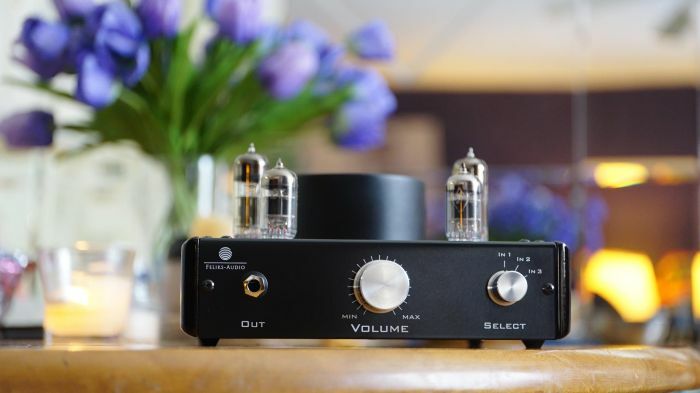 These stock tube selections are good and more than passable, but do limit the potential this amplifier is capable of. 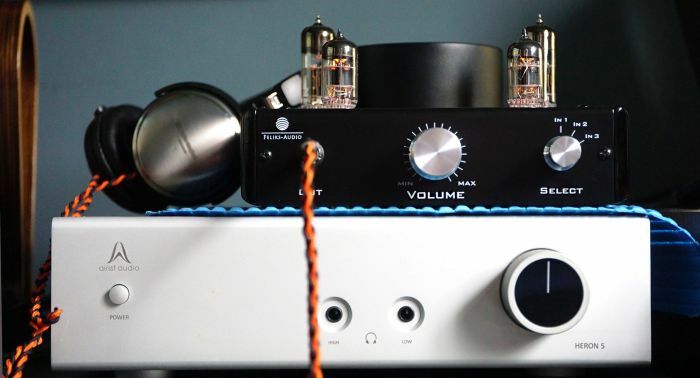 If you are into tube rolling, feel free to drop a message below with your results, as there are countless reports of obscure and common tube pairings for this amp that apparently sound good. This amp is by no means a bass head enthusiasts dream, but I can testify in court that it does justice to the likes of my favorite over ear mid tier headphone: the Sony XB1000, which is a headphone that most bass heads consider the cream of the crop for your low end needs. I agree with that, close call between the XB700 and the XB1000, but both are easily top tier for just how nutty responsive a headphone can get on the bass end of the spectrum. The Espressivo could use a subjective small bump and boost down below and I say that only because I love my bass quantity to be borderline insane. As for an objective field of view, I feel the Espressivo to be perfectly tuned in quantity and in comparison to the physical quantities of mids and treble it also brings to the table. I think I’d rate this as a slight bass boosted low end, something that won’t likely feel overly linear or lacking, but also something certainly not grossly overpowered and overflowing with bass quantity. Switching up between my gen1 Asgard and the Expressivo showcases noticeably more bass quantity. The bass lacks that ugly broadness and brooding sense that most lower end and mid tier amplifiers have. Instead, it served up a bit of both types of bass textures: just a bit of thickness, but also still clean and clear enough to consider well into the “very clean” texturing type. Similar to how Audeze setup their original LCD series Planar headphones, I feel like Feliks Audio did the same here with their Espressivo’s low end. From a musical lovers standpoint, we all are jumping for joy. Although, the purists out there who desire clinical texture and tone should be opting for something else I think. Despite the nice level of clarity available here on the bassy end of things, the Espressivo has yet to sound like something I would ever consider accurate or tonally uncolored down below, instead opting for a plentiful vibe in quantity in the bass experience. Tracks from Vaun, an underground Mindstep artist that I adore, really shine with this amp for all low end needs. Check out the track called Listen by him, which you can find on Youtube or Soundcloud…if you are into relaxing, slow paced trance and extremely deep bass, this guy is for you and so are similar artists like Stickman. Lately, I just sit back in my Eames chair with a scotch in one hand and a bubble gum flavored vape pen in the other, simply winding down at the end of my days to visceral bass mixes like these through my XB1000 and Espressivo pairing. Try not to take that as me saying this is a bass heads delight, just know that all three primary areas of listening (bass,mids and treble) are plentiful and not lacking in the slightest and the entire low end puts out great quality and quantity at the same time. You’ll not likely ever feel the low end to be too thin, nor will you feel anything resembling a bloated tonality or texture. Much like the low end, the entire midrange feels vibrant and into the first steps of what I would call mid-foward. Thankfully, there isn’t a reverse V-shape (midrange bloom effect) where mids feel more prominent than the bass or treble experience. Instead, the Espressivo is setup with what I would consider equal bass, mids and treble quantities. 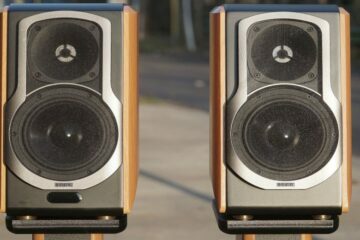 Nothing fights for attention and things feel more than forward enough to consider this a vividly engaging amplifier, but also one that isn’t too in your face and that cannot pair well with the wide recordings in Classical music, or live concerts with a large venue physicality and sense of air. Typically, these genres don’t pair well with overly forward presentations…so thankfully, Feliks Audio tuned the Espressivo with some forwardness, but made sure to not overstep it and go too far forward. With a forward enough presentation to be considered vivid, I can safely say that most genres or tracks with a focal point on vocals are going to feel quite pleasing to the ear. Sinatra lovers and similar Jazz enthusiasts will enjoy this amp, especially so if you own sets that are a bit slow on the draw like the Philips X2 or one of the upper-mid tier Audio Technica’s that are known for their excellent midrange. 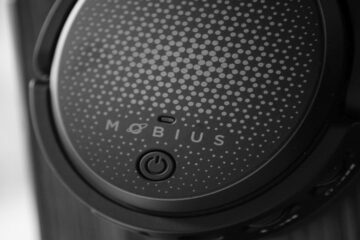 I feel like quick drivers or clinical headphones in general don’t mesh with this amplifier’s slightly boosted vibe, but that is a completely subjective statement and not based on fact. Truthfully, I can’t really spot anything wrong or negative here, the amp is hand touched and tuned by an actual human and parts were not just tossed into the mix with the hopes of a decent end result. No sir’s, this is one of the few amps that plays well in most areas. I feel strongly about how nice this Espressivo can handle vocalists and anything mid-centric, but I could do wish a smidgen more softness had been added to the entire spectrum. By comparison to the effortless and slick as butter Airist Audio Heron 5 ($2000), the tone and slam of the Espressivo feels much more potent and less silky. If you like Schiit’s house sound, I think you’ll enjoy this one from Feliks Audio as well. I’ve heard much harsher amps, but there are also plenty of softer feeling amps out there as well. There are times where I an unsure if I’d just heard potent treble, or if it had been the recording searing its way into something a bit hot in quantity. After hours upon hours of listening, I am going to side with those who say the treble experience on this amp is actually a bit on the clinical side and can vary from soft to potent, depending on the track’s quality. When I use my HD800 with this amp, I feel like turning down the upper end -2dB sometimes, but I feel like the bass and midrange don’t need to be touched by comparison. I don’t think you’ll want to specifically pair this with an HD800 or anything known for exceptional staging, but as a gateway amp to something much better, this Espressivo is a great start for the price. Solidity and that density factor at the sub $300 price point is hard to come by these days, but seems like most of my personal lot of headphones mesh very well with the Espressivo. I tend to love that weighted feeling and realistic density factor: the ATH ESW11LTD and my new Sony XB1000 for example, both of which have an excellent dense appeal without even a hint of thinness to their presentations. These types of headphones will combine well with the Expressivo and I can’t really think of another tube amp sub $300 that felt this solid and plentiful from top to bottom. Schiit’s Valhalla is close, but not quite as dense feeling as this Espressivo to my ears. At the end of this, I am scoring the Espressivo near perfectly. If it weren’t for the lack of input and output types, it would have been my first 10/10 amplifier review that I’d posted in the past 10 years of writing about audio products. This amp really sounds wonderfully musical and lacks nowhere, yet it is priced well under what the actual sound quality matches up with. Head Fi’ers agree, Feliks Audio does amazing work and they are highly praised out yonder on other forums as well. I’ve got to say, this one is a real golden ticket for me as a musicality chaser, someone who doesn’t want a pure or accurate tone. I don’t think the extreme clinical tone chasers should invest in this, but if you are in the middle and might enjoy a bit of both with the potential to EQ to achieve a boosted appeal to your desired presentation, or want a forward and linear sound with plentiful everything…this amp comes highly recommended. Damned if I can even think of something negative to say about her…she is powerful enough to drive 300ohm headphones with ease and room to spare, looks great, sounds great and has an even better price tag. Color me impressed, this one is a keeper and then some. The Espressivo is certainly the best $400 and under amplifier I’ve ever heard. Great job, Feliks Audio! I need your advice. I have sennheiser hd 650. I’d like by headphone amp. Now I’m choosing between Burson Soloist SL MKII and Feliks Audio Espressivo. I never ever had tube amp. Could You compare these amps? Is very hot Espressivo body? For this one, I would choose the Burson due to the higher voltage output on High Gain. The HD650 holds more authority with more powerful amps (in my opinion) and the clarity between these two amps is roughly on par with each other, so it won’t matter which you go with really for this headphone. I have both and the HD650 here testing for you and I find the HD650 more enjoyable on the Burson instead. But this is a rare case, for most other headphones I would probably recommend the Feliks instead because it has more treble energy. Yes, the Feliks tube amp gets hot near the tubes area. The Burson does not and stays cool. Hope that helps! The concluding sentence still includes the wrong price (“$300 and under”). Will do better in the future and yes, I meant to say the Valhalla. I owned it for a few years and I feel like the Feliks amp is a little better. Valhalla 1 correct? I’ve been pondering between the Feliks and the Valhalla 2 – both look quite nice and they’re both pretty much designed for to do the same thing and perform with the same kind of headphones. Leaning toward the Feliks because living in Europe myself the Schiit is an US product and costs maybe an extra $80+ dollars. Any experience with the Valhalla 2 at all? All good if not, just figured I’d ask, thanks so much for the fantastic review! You are very welcome. Also, I owned the first generation Valhalla and have not heard the 2nd generation of that. Wasn’t aware there was a newer model. Both are very friendly to Tube Rolling so it really doesn’t matter which door you walk through. The Feliks is better overall than the Stock Valhalla, but I know for a fact that proper tube pairing can really improve the sound. I’ve not rolled the Feliks nearly as much to find out what the outer limits are. But, I spent a long time with that in the Schiit amp. Despite all that, I am really happy with the stock tubes of the Feliks and dont feel like I need to roll. However, I did feel the need to roll my Valhalla. Appreciate you sharing your views on the comparison between the two! This is my first tube amp so not needing to roll is a plus seeing as I’m very clueless as for how each tube sounds and which fit where, etc. If you don’t mind my asking, most my headphones are quite bright and demanding sounding and I want to smooth them out (Beyer T90s, HE-560s, etc) a bit to make the listening experience a bit more relaxed, hence my venture into the tube world, which of the 2 would you say works best with brighter sounding headphones? Feliks – Smoother overall, less impact and slam, but more prevalent in brightness potential, more treble on stock setup. 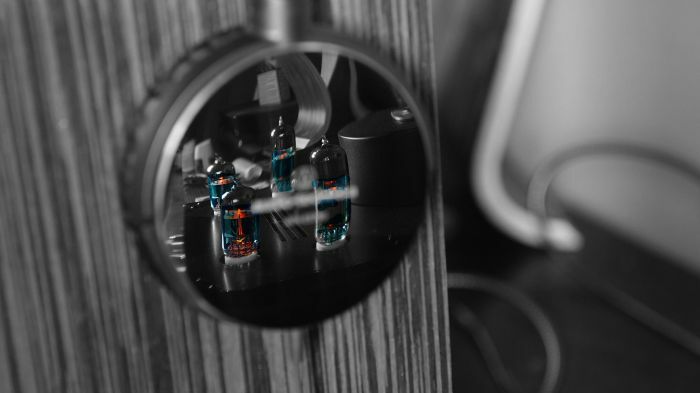 Schiit – Less smooth, more impact, but also required certain tubes to achieve what I thought was plentiful quantity in treble. “Go ahead. Do things with Valhalla 2 that you’d never attempt with other OTL tube amps. Run low-impedance headphones. Use IEMs. Valhalla 2 is a complete re-imagining of Valhalla, with improved performance, higher output capability, lower distortion and output impedance. The Valhalla seems like the much wiser choice for you, but even then I’d prefer to run full solid state with any Planar. You might be better off with an Asgard instead. I was more fond of the Asgard than I was the Valhalla. Oh yea absolutely, I kind of put the Hifimans there as a knee-jerk reaction when listing headphones I own, I run those through the SS headphone amp portion of my Marantz HD-DAC1 so it’s not a big deal if the OTL I get is not fit for planars. Thank you for pointing it out though! As said I’m mostly looking for something to tame the how picky and some times a little too aggressive in the treble my T90 Jubilees can be some times with my current SS solution – I guess with some proper tube rolling the Valhalla may have the edge, especially given I could even use my planars (I have a few, I’m usually a planar guy) with it though I have no real need to, options never hurt. Only thing keeping me back is the price difference and the retro look of the Feliks which I really like, plus you say it is smooth sounding which works very well with the music I listen to and may agree with the T90s. Will see what happens, thanks so much for your help though your impressions are extremely valuable – so hard to find comparisons between amps at this price range usually, probably because tube amps are usually quite a bit more expensive than $300-400. Wish my current budget was big enough, I’d just buy the Schiit Mjolnir 2, swap to my balanced cables and be sorted for a long time! I also owned the Mjolnir gen1 and didn’t keep it. Also haven’t heard the new 2 version, but I was glad to see they added a normal headphone 1/4 out. At that $500+ mark, pretty much everyone is agreeing that the Feliks Elise is ungodly amazing. I’ve not heard anyone recommend me the Mjolnir 2, but I get Elise recommendations all the time. People really love that amp. I’ve heard it once, was floored and was the reason I got a sample Espressivo first. In that time, I got an Airist Heron 5, so I’ve shelved my plans for the Elise for the moment until I can better afford it. Haha. I highly recommend the Elise, it was bloody fantastic at the audio meet I attended. I’d recommend that (even though I have little experience with it) over the Mjolnir 1, that is for sure. But, I can’t say anything about the 2nd gen Mjolnir. Feliks makes great stuff, Schiit does too but the praise for the Elise far exceeds the Mjolnir 2 so far as I’ve read. Oh yea absolutely, the Elise seems to be insanely highly regarded and I do hope to be able to maybe try one one day. The only thing that slightly puts me off the Elise is the fact that everyone seems to be crazy about tube rolling it, using massive tubes with adapters and all that which I’m sure gives it an amazing, wide range of different beautiful sounds. It’s not that I am opposed to it obviously, I’m just too new to all of this to fully profit from all its capabilities I feel. Plus I already have my T90s recabled with balanced litz as well as my planars so I’d want to try a balanced amp at some point to see what all the fuss is about compared to SE. It is quite remarkable how much praise the Elise gets everywhere I look, it must be so meaningful for a family run business from a small country such as Poland (I’m from a small country myself so I know all about business in these parts!) to have people react to their products this way, it’s a pretty big part of why I’d want to support their business myself too (nothing against Schiit of course). I’ve read about the Heron 5 and I have to say it looks beautiful too, I’m sure you’re very happy with it! I’ve invested quite a lot into my audio equipment as of late as well, hence I’m a little bit restricted with my budget for my first tube amp but such is life haha. I think the Mjolnir is just overkill for clarity needs for the headphones you have. The only way I could see myself spending that much with those headphones and that amp is if I (you) find the combination a win. For specs, it just isn’t needed and you’ll max out the clarity of the HE560 with cheaper amplifiers. I’d sooner recommend you the older Burson HA160 than the Mjolnir. If you want a nice and smooth sound, Burson does that best and it is a solid state amplifier. If you can drop $800US, even used, I’d still opt for a used Burson Conductor over the Mjolnir. With smoothness and toned down treble brightness…Burson takes the win there over the Schiit amps and I think we would be hard pressed to find someone who disagreed. A used Conductor has better imaging prowess, smooth tone and less physical impact than the Mjolnir, but the Schiit amps have much higher wattage output. But…you don’t need that with the T90 or the HE560, neither are particularly difficult to drive and it seems like the majority consider the low end of the HE560 to not boost in quality with a lot more power behind it. I agree with that statement made by many others. The allure of Balanced amps is very tempting, but I don’t think the T90 or the HE560 benefit enough with a fully balanced rig to really merit dropping $899 on a Mjolnir2. If anything man, drop that on the Cavalli Liquid Carbon. That should be your first step, plenty of smoothness and dynamics, a good amount of power, lots of output adapter type options. The CLC is really hard to beat at that price range for a can do anything type of amplifier. If you wanted a single ended only, look at the Elise. If you want a ton of power output, then the Mjolnir 2 would probably be the better route in that price range. The problem with my Mjolnir was that I just couldn’t tone match it with another balanced Dac. Im afraid there isn’t a easy answer for any of this. Rig pairing (dac+amp+headphone) is so vital these days. But I circle back and say your amp selection is still overkill, the HE560’s max clarity and imaging potential can be pushed in less expensive amplifiers. You’ll be super happy with the Cavalli Liquid Carbon or the older Burson HA160. My vote goes for the Cavalli, it has all the qualities you’d want: Balanced output, single ended 1/4, 3.5mm, good power output far more than your headphones actually can benefit from (at least in my opinion), it is small and not huge like the Mjolnir’s. I know this is an old thread, but I am currently considering the Vahalla 2 and the Expressivo as an upgrade to my Little Dot MK III. Unfortunately, the Expressivo price has increased substantially–it’s now $449, or $504 with shipping to the US; the Valhalla 2 is roughly $385 with shipping in the US. I don’t know what the stock tubes were in the original Valhalla, but the Valhalla 2 and Expressivo use the same stock tubes–6N6P driver tubes and 6N1P driver tubes, though I imagine the same tube can sound different in different amps. The Valhalla 2 also puts out considerably more power (800mW at 300 ohms compared to 400 mW for the Expressivo), though again, this is not necessarily dispositive. Given this, is the Expressivo worth roughly a third more than the Valhalla 2? I’ll be using the amp primarily with Sennheiser HD700s and am awaiting a 6XX from Massdrop. 1.What headphone impedance does the the 400mW output power refer to? 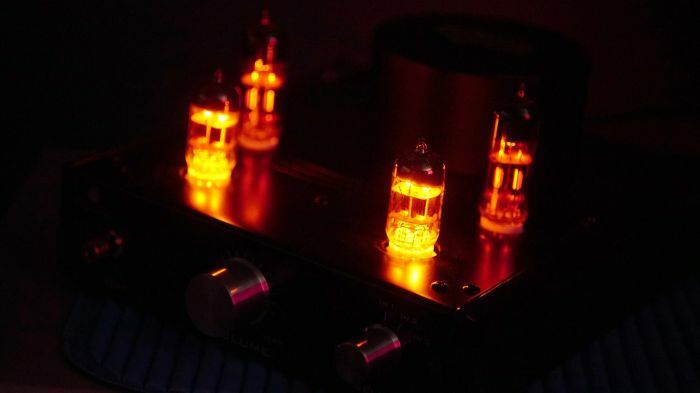 2.Can Octals, like 6SN7 tubes, be substituted for the driver and power tubes using suitable 6SN7 to 6DJ8 adapters? I am confused on the price. The article states $289. When looking at Feliks Audio site, it says $349.00 USD. Current price says $289 plus shipping costs. Knowing that the price is now $389 shipped, might be worth it to update the article with the correct pricing since such a big part of the “theme” is that it’s a great amp for under $300, but it costs more than $300.